Watching the Royals game on Tuesday night, it was as if the 2015 championship version melded with the dreadful 2018 club. A bizarre night, indeed. The Royals channeled the 2015 vintage as they kept the line moving with six doubles and four steals. The 2018 Royals manifested in a pair of double plays and, as they threatened to break the game open early, saw their number three batter called out on strikes with the bases loaded. The result was irrelevant. At least as irrelevant as can be for a team chasing the number one overall draft pick next June. What mattered was, for at least one night at The K, baseball was entertaining once again. The star on Tuesday was Adalberto Mondesi. He collected two of those six doubles and was responsible for three of the four steals. He also electrified on defense. Mondesi, as we are well aware, has bounced between the upper levels of the minors and the big league club. Once the team’s top prospect, Mondesi has struggled in his cups of coffee and was pinched for testing positive for Clenbuterol. The prospect luster has long faded (partially due to him accruing enough service time back in 2016 that he can no longer be technically considered a prospect), but Mondesi remains a key player as the Royals start their journey on The Process 2.0. Mondesi wasn’t recalled until mid-June, but has played fairly regularly. After Tuesday’s game, he’s hitting .279/.295/.450. He still has a ways to go to fulfill the promise of his prospect years, but has been worth 0.5 fWAR in his time with the team. Escobar was signed when there were apparently no other bidders for his services. He played every game up until July 8 (the Royals’ 89th game of the year) and has sat on the bench for six games total this year. After Tuesday’s game he’s hitting .203/.255/.283. Among batters with at least 400 plate appearances this year, his .202 TAv is the second worst in baseball. (Chris Davis with a .200 TAv is at the bottom.) Escobar has been worth -1.0 fWAR. This is the purgatory where General Manager Dayton Moore often resides. Ride with the known veteran commodity and lose or go with the upstart struggling to find his major league footing and perhaps lose some more. Moore, as we know, can’t stomach the losses and loathes the idea of tanking. So the Royals get a return engagement of Escobar and a few other highly paid and underperforming veterans. 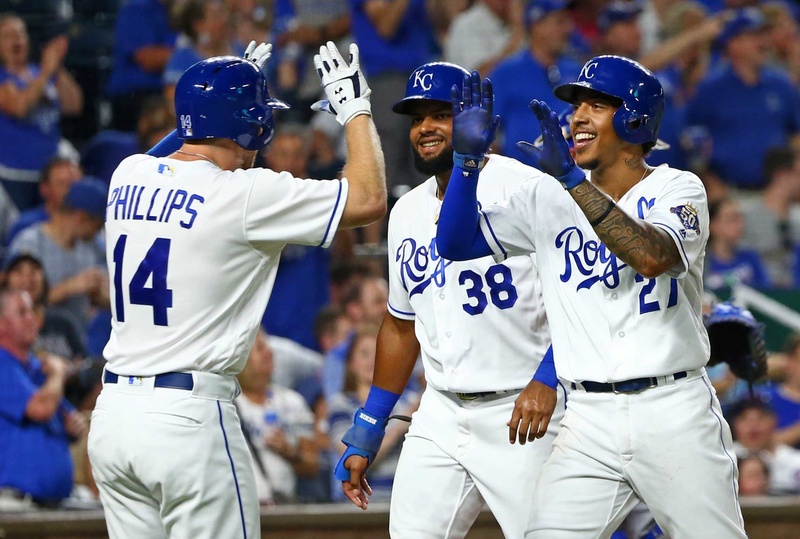 With around a quarter of the season remaining, now is the time for the Royals to jettison the veteran bats and unleash the kids. The process is already underway as we’ve seen with the trades for Brett Phillips and Brian Goodwin, the waiver claim of Rosell Herrera and the return from suspension of Jorge Bonifacio. This trio, along with Mondesi, needs to be in the lineup everyday. That means there’s no room for Lucas Duda, Escobar, and as much as it pains me to write it, Alex Gordon. Duda should have some value somewhere as a left-handed platoon option. Either trade him for an organizational guy or let him walk. Gordon has a contract that makes him untradeable, so he’s not going anywhere but the bench. Escobar has no value whatsoever and needs to be released outright. The remainder of the season will be ugly, but not any uglier than we’ve already seen. Play an outfield of Herrera, Phillips and Bonifacio every day. Mix in Goodwin when he returns from the disabled list. Move them around on the field and in the lineup and find their optimal roles where they could maximize their potential in the future. And light a candle for Jorge Soler. On the infield, let Hunter Dozier bounce back and forth between first and third. I don’t believe he’s a big leaguer by any stretch, but we have nothing but time, so let’s double check that assessment. Give Ryan O’Hearn a few reps at first and keep a first baseman’s mitt warm for Salvador Perez. Why not? We know Whit Merrifield can play just about anywhere, so there’s really no need to move him around, so let him get some reps up the middle with his double play partner Mondesi. Add the possibility of Herrera at third just for fun. Basically, if you’re over 26, you’re out. Perez and Merrifield are the exceptions. At least they’re under 30. Play the kids and play them exclusively. Mix and match and see what they can do. Some things won’t work, but maybe something positive will happen that can shape the future of a particular player. The Royals will never find out about some of these players unless they commit. They’re on pace for 113 losses. Who cares about the record when it’s that subterranean? Pave the road for The Process 2.0. Once Salvy is no longer able to catch full time, his value plummets. There are plenty of 1st Base/DH types available who can hit 20 HRs with a sub .300 OBP. The Royals should explore his trade value as there is little hope that he’ll be playing at an All Star level by the time the Royals hope to contend again. There’s little hope any of us will be alive by the time the Royals hope to contend again. Pick another team Josh. We love our Royals and see it a different way.